This is another crewel work project. I really like working with the wools, but I still have a limited collection of colors. That will be changing soon! This was fun to work on. There are actually quite a few stitches squeezed in there. To be honest I wasn’t 100% happy with the placement of the flowers, but I will make a few adjustments! Oh gorgeous! I'm doing some crewel work at the moment – though I can't share, it's a secret. I'm loving it! I see more of it in my future. 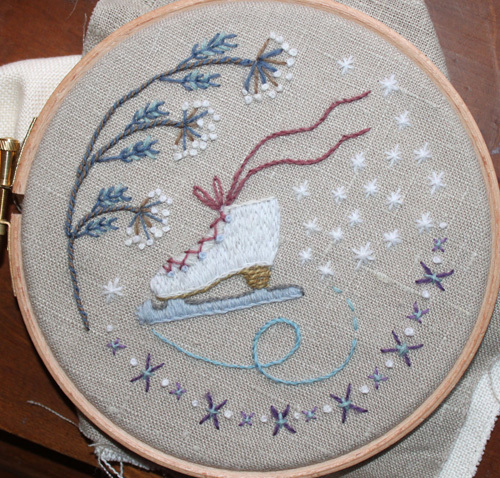 I can't wait for the Embroidery Journal challenge, though I'm a little scared – I'm not sure what to do!